Successfully Added IPhone and IPod Universal Dock - IDock to your Shopping Cart. iPhone and iPod Universal Dock - iDock for charging your iPod or iPhone. This deluxe iDock gives you several great functions in one. Use the dock to charge your iDevice, synch with your computer, or even send your iPod or iPhone audio bigger speakers with AV Out! Now you can listen to and share your iPhone / iPod media files from your home multimedia center or computer. This dock is great for holding your iPhone or iPod at home or at work. Using this deluxe dock is easy. Connect your iPod or iPhone to the dock, then attach the dock to a USB port on your computer to start charging. To listen to the output from your iPod or iPhone on external speakers, use the included AV cable to connect the dock to any speaker with regular red, white, and yellow AV-In jacks. It's that easy! This deluxe charging dock makes a great item for everyone who loves iPods and iPhones. Buy one for yourself, a few more to get ready for your friends' birthdays, and some more to sell on eBay. The more you buy, the more you save on both per item cost and shipping discounts. From your best source of high quality, low price electronics, Chinavasion. Will this work with my iPod classic, Touch or Nano? 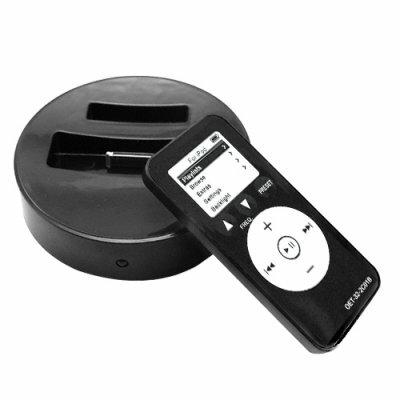 This gadget works with all the iPod family products except the 2nd generation of the classic iPod. Does this work with my 3G iPhone? No. This works with 2G iPhones but not the new 3G version.